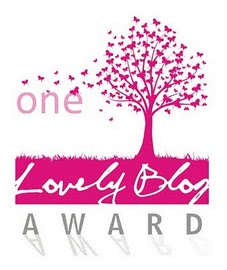 I’ve just been nominated for the One Lovely Blog Award by barrentoblessed, a fellow blogger who shares about faith, life, and especially infertility and motherhood. Head on over to check out some of her thoughtful, honest posts! While these awards can sometimes seem as unwieldy as those chain e-mails most of us grew to despise, I do think they are a wonderful way to encourage fellow bloggers and to help folks find each other in this broad blogosphere, so thank you, barrentoblessed! As per the requirements of this award, I’ve let you know who shared this award with me; below I’ve included the requisite seven personal tidbits and fifteen blogs I think are worth checking out. If I’ve linked to you, don’t feel as if you MUST continue this award. Just bask in the glow and move on, if you’d rather. 2. I was once told that I would never walk again. Then I was told that I would DEFINITELY never run or jump. I guess God knew how fast my (not-likely-to-be-naturally-conceived) kids would be able to move and adjusted accordingly. 3. For as long as I can remember, my hobbies have been reading, writing, and doing craft projects (drawing, painting, sewing). 4. If I had a clue how, I’d start a custom mural-painting business. I’ve painted walls in my mom’s house, done a nursery for my sister, and painted two different kids’ rooms for my sister’s friend, and I love doing it. 5. Despite the fact that I love painting murals, I have not painted a single one in either home we’ve lived in during the 6.5 years we’ve been married. I have no idea why not. 6. Lately, I have been on a nonfiction reading kick. This strikes me as odd, since I’ve never been really big on nonfiction before. 7. I wish I were good with tools. Any kind, though construction-type would be most helpful, given the amount of work to be done yet on our fixer-upper house. Sadly my father-in-law, who is pretty handy, always told my husband that his household fix-it jobs were one-man tasks, so ‘Love never learned to work with his hands, either. We would save either a lot of money or a lot of headache (or both) if one of us had a clue how to work with wood, drywall, tile, or any other construction material.